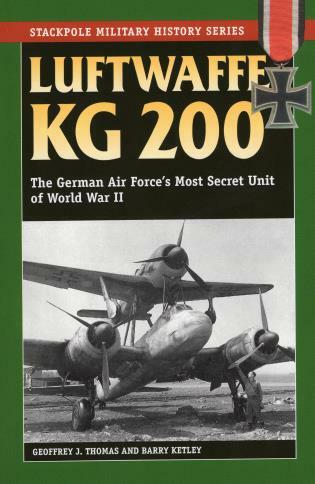 Shrouded in secrecy during World War II and obscured by myth ever since, Kampfgeschwader 200 (200th Bomb Wing) remains one of the Luftwaffe's most fascinating formations. Considered a special-operations unit, KG 200 delivered spies while flying captured Allied aircraft, conducted clandestine reconnaissance missions, and tested Germany's newest weapons--such as a piloted version of the V-1 rocket (essentially a German kamikaze). The late Geoffrey Thomas was the author of Eyes for the Phoenix: Allied Aerial Photo-Reconnaissance Operations--South-East Asia 1941–1945 (978-0-9519-8994-4). Barry Ketley is the author of French Aces of World War 2 (978-1-8553-2898-3) and Luftwaffe Emblems (978-0-9554-2683-4).